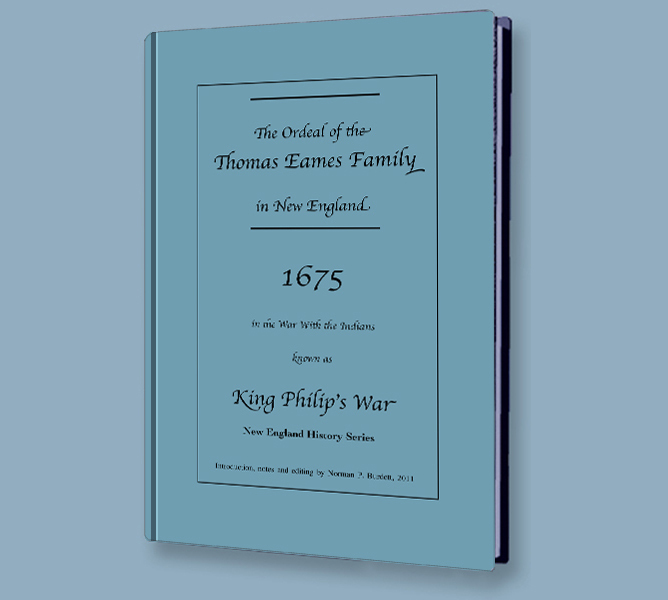 In 1675, the Thomas Eames Family was trying again to make a go of it. Thomas and his wife Mary had each been widowed and had children that they brought to their marriage. They also had three children together. Thomas had been "maimed in his limbs", perhaps when he served in the Pequot war as a nineteen year old; or maybe it happened on the farm or perhaps in the stone quarry... the records don´t tell. In the 38 years that followed, he´d been a bricklayer and stonecutter, a miller and a farmer. He and Mary sold their small (eight-acre) farm in Cambridge, MA and moved to Framingham. Farming was going well there, but once again there were problems between the English and the Indians. This time, the Wampanoags and others were lining up against the growing settlements of the colonists. There had been soldiers billeted in the Eames house, protecting them and their neighbors, but now they were needed elsewhere. Thomas hitched up the horses and took the wagon to Boston for ammunition... would he be back in time? The really interesting thing in this account is that there were Indians accused of crimes and they were given trials despite the fact that this happened during a time of war.